Testimonials | Aman Builders Inc.
Partnership is not just a philosophy for AMAN Building Corporationit is a way of life. We are just two months away from moving into a new facility that is being built by AMAN. I am convinced as we near completion that I could not have made a better choice. All of my concerns and fears associated with a project like this that lurked in my mind have never materialized. The working relationship my staff and I have had with AMAN while working on this project have been exceptional, from the Project Manager to the Site Supervisor and all the contractors involved. 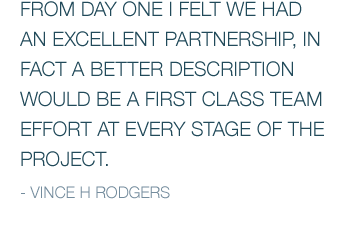 From day one I felt we had an excellent partnership, in fact a better description would be a first class team effort at every stage of the project. The companys ability to include all stakeholders, students, staff, parents and community was a great asset and served the projects well. AMAN strives to complete projects on schedule, on budget and with the highest degree of excellence. The cooperation, assistance and experience of the site and office management in working with the owners, user groups and consultants was a major factor in the successful phasing and maintaining essential services throughout a difficult and challenging renovation program. As a partnered project, AMAN provided valuable input and solutions to many issues that arose during design and construction, accepted input from the affected parties as well as implementing the decisions made by National Defence. This free flow of communication allowed the project to be completed within budget. AMAN has provided us with a level of quality and aesthetics that meets or exceeds our original expectations. AMAN became immediately involved in the projects, contributing to effective and practical construction solutions to complex design issues in a proactive, professional manner. AMAN was instrumental in the development of pre-tender reports and confidently stated and delivered the Grey Nuns project under budget at tender. Also, AMAN by their early involvement on projects, have helped us develop techniques and audit methodologies that we have subsequently integrated into our Quality Management System. While AMAN may not be considered a large construction company, they should be considered as a quality Builder. Their ability to bring competitive yet accurate pricing to the tender process is an asset to an Owner striving to get value for his dollar.